It could be “the” night and those who can’t make it to the Spiro Center can follow the action live on ESPN3. 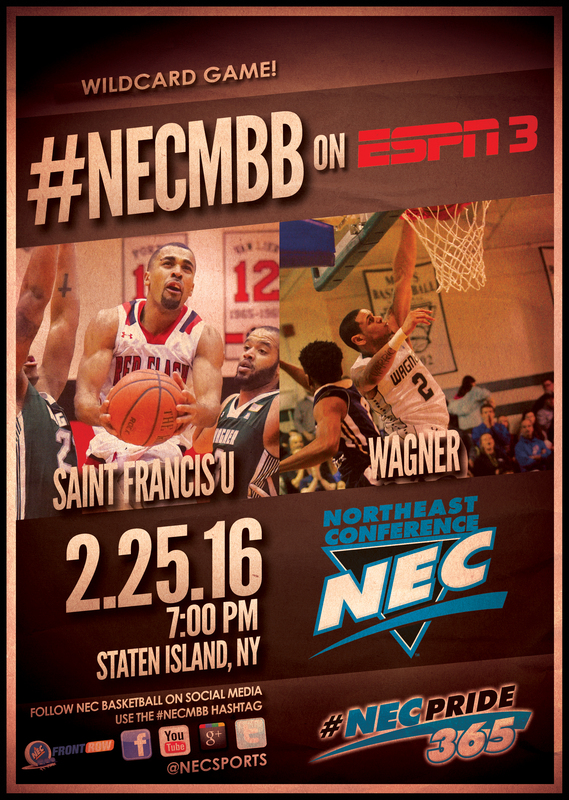 Wagner is one victory away from clinching the 2015-16 #NECMBB regular season crown and the league has pegged the Seahawks’ next contest as the league’s feature “Wildcard Matchup” on ESPN3 and WatchESPN. 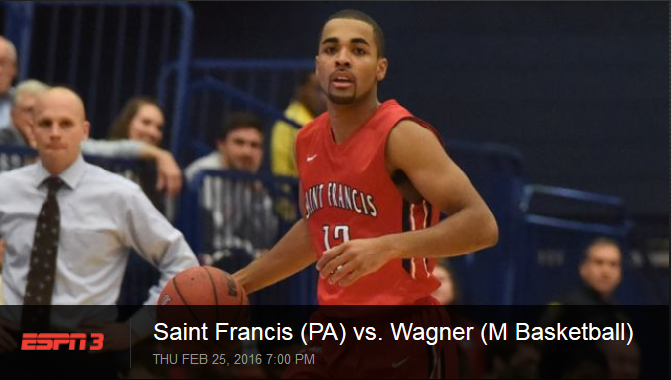 It’ll be Saint Francis U at Wagner on Thursday, February 25 at 7:00 pm ET. The contest will close out the regular season portion of the #NECMBB on ESPN3 schedule. The Seahawks (11-5) enter the final weekend of regular season play owning a 1.0-game lead over both Sacred Heart (10-6) and Mount St. Mary’s (10-6) in the NEC standings. Guaranteed to triumphantly emerge from any possible ties, Wagner needs only one more victory to sew up the top seed, and the home-court advantage that comes with it, in the upcoming NEC Tournament. Thursday’s featured affair is rather meaningful for visiting Saint Francis U, too. The Red Flash have secured a spot in the NEC Tournament, but sit in a three-way deadlock for fourth place. A fourth-place finish or better means Saint Francis would earn the right to host NEC quarterfinal round contest. With a win on Thursday over Wagner coupled with a win on Saturday, SFU would guarantee itself a postseason home game. Saint Francis U is responsible for one of Wagner’s five league losses. The Red Flash grounded the Seahawks, 73-65, in the conference opener back on January 2 in Loretto. Five different Flash, including two bench players, scored in double figures that day. Wagner leads the league in scoring defense (64.3), free throw percentage (.724), field goal percentage defense (.409) and rebounding margin (+6.9/g). Saint Francis U is the NEC’s top three-point shooting team, connecting at 36.6 percent from downtown. 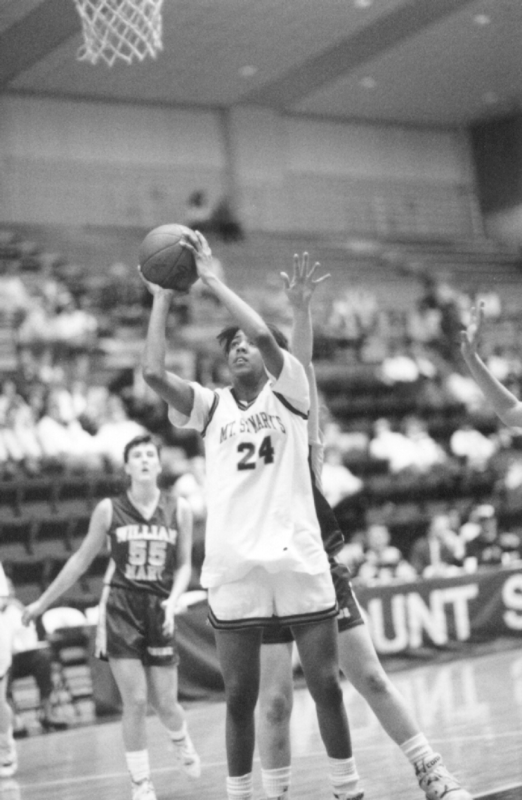 Vanessa Blair (above) scored 1,488 points in a Mount uniform. Mount St. Mary’s presence in the women’s basketball wing of the Northeast Conference Hall of Fame tripled this year with the enshrinement of Bill Sheahan and Susie Rowlyk. 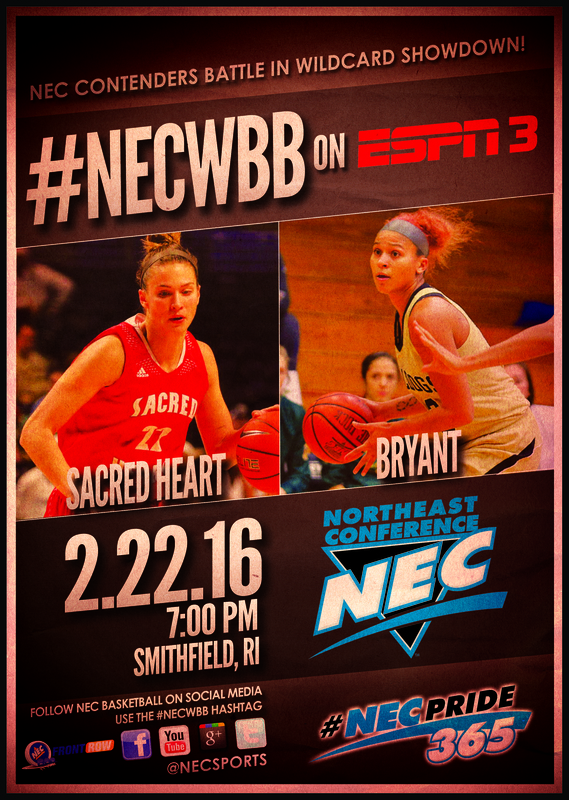 The Grudge Match was pegged as the featured #NECWBB wildcard game on ESPN3, and it didn’t disappoint. Sacred Heart and Bryant, the top-two teams in the league standings, tussled in a tight one for the second time this season. Repaying the Bulldogs for a 61-59 defeat back on January 30 in Fairfield, Sacred Heart eked out a 64-60 victory on Monday night in Smithfield. It was a well-played affair by both sides, leaving the exciting thought of a possible rubber match between the Pioneers and Bulldogs in the NEC Tournament. Little separated the two teams except for free throw shooting. Sacred Heart made 19 shots from the charity stripe while Bryant earned a total of only nine attempts. SHU small forward Hannah Kimmel, who scored a game-high 22 points, was a perfect 5-for-5 from the charity stripe. Meanwhile, Kelcey Castro, who earned BAYER Player of the Game honors, sank 5 of 6 attempts from the line en-route to 17 points for the Pioneers. With the win, Sacred Heart extended its lead over second-place Bryant to 2.0 games with two to play. As a result, the Pioneers have clinched at least a share of the NEC regular season crown for the fifth time since joining the league for the 1999-2000 campaign. Over a nine-day period, the Northeast Conference disseminated preseason poll results from eight spring sports.